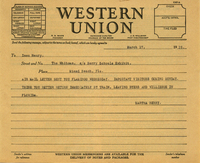 Martha Berry informs Inez that an air mail letter was sent to the Flamingo on Wednesday, and that important visitors are coming Sunday. 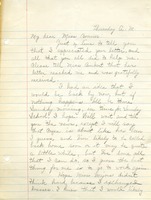 She recommends that Inez return immediately by train. 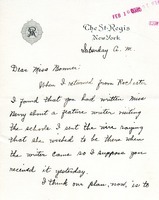 Letter from Miss Berry to Miss Nicholoy. 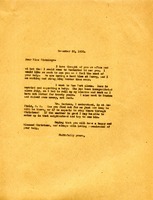 Letter is just a letter asking her how she is doing, etc..
Inez writes from New York about plans for the visit of a feature writer to the schools, and Martha Berry's wish to be at the school during the visit. She discusses travel plans, and then speaks of the weather in Rochester.